In this section I will be borrowing facts from the book The Crystal Bible Volume 1. written by Judy Hall. Appearance; Waxy and soft, usually banded, sometimes translucent with small crystals, various sizes. Often sold as artificially coloured slices that have no additional therapeutic properties. Psychologically, Agate gently facilitates acceptance of one 's self. This builds self - confidence. It aids self - analysis and perception of hidden circumstances, bringing attention any dis-ease that is interfering with your well being. Agates enhance mental function as they improve concentration, perception, analytical abilities, leading to practical solutions. Agate's love of truthfulness encourages speaking ones own truth. Agates with clear crystals can stimulate memories. Emotionally, this crystal overcomes negativity and bitterness of the heart. It heals inner anger, fostering love, and the courage to start again. It is useful for any kind of emotional trauma. It creates a sense of safety and security by dissolving inner tension. 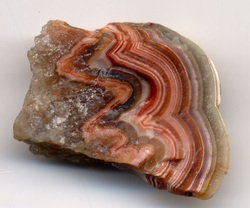 Spiritually, Agate raises consciousness and links into collective consciousness and awareness of the oneness of life. It encourages quiet contemplation and assimilation of life experiences, leading to spiritual growth and inner stability. Healing; Agate stabilizes the aura*, eliminating and transforming negative energies. Its cleansing is powerful at the physical and emotional levels. Placed on the heart, it will heal emotional dis-ease that prevents acceptance of love. Placed on the abdomen or taken as an Elixir, Agate stimulates the digestive process and relieves gastritis. It heals the eyes, stomach, and uterus; It cleanses the lymphatic system and the pancreas; it strengthens blood vessels and heals skin disorders. Position; Hold or place on appropriate body location. Blue - Green Agate: Is usually artificially made glass and has no therapeutic properties. Green Agate: Enhances mental and emotional flexibility and improves decision making. It is useful in resolving disputes. Pink Agate: Promotes love between parent and child. Position over the heart for optimum effect. Botswana Agate: Found only in Botswana, this Agate is excellent for anyone connected with fire or smoke. It is beneficial for smokers and those who want to quit smoking. Botswana Agate looks to solutions rather than dwelling on problems. It helps you to explore unknown territory and your own creativity. At a mental level, it helps you to see the bigger picture. At an emotional level, it gently releases repression. This agate often has nodules or ovoids and, being gray and usually found as a nodule, it looks like the brain, with which it resonates. It is particuarly useful in helping the body to assimilate oxygen, benefitting the circulatory system and the skin. It also aids depression . At a non physical level , it stimulates the crown chakra*, bringing energy into the auric field. Attributes; Strictly speaking, Amber is not a crystal at all. 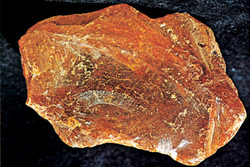 It is tree resin that solidified and became fossilized. It has strong connections with the earth and is a grounding stone for higher energies. Amber is a powerful healer and cleanser that draws dis-ease* from the body and promotes tissue revitalization. it also cleans the environment and the chakras*. It absorbs negative energies and transmutes them into positive sources that stimulate the body to heal itself. A powerful protector, it links the everyday self to the higher spiritual reality. Psychologically, Amber brings stability to life but also motivates by linking what is wished for the drive to achieve it. Its warm, bright energies translate into a sunny, spontaneous disposition nevertheless respects tradition. It can help counteract suicidal tendencies. Mentally, Amber stimulates the intellect, clears depression, and promotes a positive mental state and creative self expression. It brings balance and patience and encourages decision making, being a useful memory aid. Its flexibility dissolves opposition. Emotionally, Amber encourages peacefulness and develops trust. Spiritually, Amber promotes altruism and brings wisdom. Healing; Amber is a powerful chakra cleanser and healer. At a physical level, it imbues the body with vitality and has the power to draw disease out of the body. By absorbing pain and negative energy, Amber allows the body to rebalance and heal itself . Amber alleviates stress. It resonates with the throat, treating goiters and other throat problems. It treats the stomach, spleen, kidneys, bladder, liver and gallbladder, alleviates joint problems, and strengthens the mucus membrane. As an elixir and for wound healing, it is an excellent natural antibiotic. It can stimulate the navel chakra and help in grounding energies into the body. Appearance; Opaque, sometimes transparent, glassy, hexagonal, crystal, various sizes, often tumbled. Attributes: Apatite has inspirational properties. The interface point, between consciousness and matter, it is a stone of manifestation and promotes a humanitarian attribute, inclining towards service. 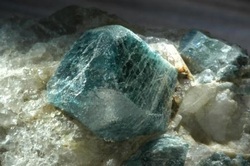 Apatite is attuned to the future, yet connects to past lives. It develops psychic gifts and spiritual attunement, deepens meditation, raises the kundalini*, and aids communication and self expression on all levels. Psychologically, Apatite increases motivation and builds up energy reserves. It induces openness and social ease, encouraging extroversion, dissolving aloofness and alienation. It draws off negativity about oneself and others. It is useful for hyperactive and autistic children. Stimulating creativity and intellect, Apatite clears confusion and helps to access information to be used personally and for the collective good. Apatite expands knowledge and truth and eases sorrow, apathy, and anger. It reduces irritability and overcomes emotional exhaustion. By releasing energy in the base chakra*, it clears frustration and endorses passion without guilt. Healing; Apatite heals bones and encourages formation of new cells. It aids absorption of calcium and helps cartilage, bones, teeth, and motor skills and ameliorates arthritis, joint problems, and rickets. This stone suppresses hunger and raises the metabolic rate, encouraging healthy eating; heals the glands, meridians, and organs; and overcomes hypertension. It balances the physical, the emotional, mental, and spiritual bodies, and the chakras, eliminating overactivity and stimulating underactivity. Used with other crystals, Apatite facilitates results. Position; Wear on skin over affected part, or place as appropriate. Blue Apatite; Connects to a very high level of spiritual guidance. It facilitates public speaking, enhances group communication, opens the throat chakra, and heals the heart and emotional dis-ease. Yellow Apatite; Is a great eliminator, especially of toxins. It activates the solar plexus and draws off stagnant energy. Yellow Apatite treats CFS*, lethargy, and depression, and overcomes lack on concentration , inefficient learning, and poor digestion. It removes cellulite and treats the liver, pancreas, gallbladder and spleen. At an Emotional level, it neutralizes stored anger, Yellow Apatite elixir is an appetite suppressant. Attributes; Aquamarine is a stone of courage. Its calming energies reduce stress and quiet the mind. It harmonizes its surroundings and protects against pollutants. In ancient times it was believed to counteract the forces of darkness and procure favor from the spirits of light. It was carried by sailors as a talisman against drowning. Psychologically, Aquamarine has an affinity with sensitive people. It has the power to invoke tolerance of others. It overcomes judgmentalism, gives support to anyone who is overwhelmed by responsibility, and encourages taking responsibility for oneself. It creates a personality that is upright, persistent, and dynamic. It can break old, self - defeating programs. Aquamarine calms the mind, removing extraneous thought. It filters information reaching the brain and clarifies perception, sharpens the intellect, and clears up confusion. With its ability to bring unfinished business to a conclusion , Aquamarine is useful for closure on all levels. It clears blocked communication and promotes self - expression. This stone is helpful in understanding underlying emotional and interpreting how you feel. It soothes fears and increases sensitivity. Spiritually, Aquamarine sharpens intuition and opens clairvoyance. A wonderful stone for meditation, it invokes high states of consciousness and spiritual awareness and encourages service to humanity. Aquamarine shields the aura* and aligns the chakras*, clearing the throat chakra and bringing communicating from a higher plane. Attributes; Amethyst is an extremely powerful and protective stone with a high spiritual vibration. It guards against psychic attack*, transmuting the energy into love. A natural tranquilizer, Amethyst blocks geopathic stress* and negative environment energies. Its serenity enhances higher states of consciousness and meditation. Amethyst has strong healing and cleansing powers, and enhances spiritual awareness. Traditionally, it was worn to prevent drunkenness (getting drunk) and has a sobering effect on overindulgence and physical passions, supporting sobriety. it overcomes addictions and blockages of all kinds. Used at a higher level, Amethyst opens to another reality. Amethyst is extremely beneficial to the mind, calming or stimulating as appropriate. When you meditate, it turns thoughts away from the mundane into tranquility and deeper understanding. Mentally, it helps you feel less scattered, more focused and in control of your faculties. It enhances the assimilation of new ideas and connects cause with effect. This stone facilitates the decision -making process, bringing in common sense and spiritual insights, and putting decisions and insights into practice. Mentally, it calms and synthesizes, and aid the transmission of neural signals through the brain. It is helpful where insomnia is caused by an overactive mind and protects against recurrent nightmares. Amethyst enhances memory and improves motivation, making you more able to set realistic goals. It can help you to remember and understand dreams and facilitates the visualization process. Amethyst balances out highs and lows, promoting emotional centering. it dispels, anger, rage, fear and anxiety. Alleviating sadness and grief, it supports coming to terms with loss. Amethyst is one of the most spiritual stones, promoting love of the divine, giving insights into its true nature, and encouraging selflessness and spiritual wisdom. It opens intuition and enhances psychic gifts. This is an excellent stone for meditation and scrying* can be placed on the third eye to stimulate it. Sleeping with Amethyst facilitates out - of- body experiences* and brings intuitive dreams . It transmutes "lower" energies to the higher frequencies of the spiritual and etheric* realms. Healing; Amethyst boosts production of hormones and tunes the endocrine system and metabolism. it strengthens the cleansing and eliminating organs and the immune system. An excellent cleanser for the blood, Amethyst relieves physical, emotional and psychological pain or stress, and blocks geopathic stress. It eases headaches and releases tension. This stone reduces bruising, injuries and swellings, and treats hearing disorders. It heals dis - eases of the lungs and respiratory tract, skin conditions, cellular disorders, and dis - eases of the digestive tract. It is beneficial for the intestines, regulating flora, removing parasites, and encouraging reabsorption of water. Amethyst treats insomnia and brings restful sleep. At a subtle level, Amethyst balances and connects the physical, mental, and emotional bodies*, linking them to the spiritual. It cleanses the aura* and transmutes negative energy, and stimulates the throat and crown chakras*. It is helpful for people about to make the transition through death. Amethyst can stabilize psychiatric conditions but should not be used in cases of paranoia or schizophrenia. Position; Wear or place as appropriate. especially as jewelry. Clusters and geodes can be placed in the environment and single points are used in healing. Place the point in toward you to draw in energy, and away from you to draw off energy. Amethyst is especially beneficial worn over the throat, or heart. For insomnia or nightmares, place under pillow. Amethyst fades in sunlight. Violet - Lavender Amethyst; Has a particularly high vibration. Double - terminated lilac crystals take you into beta brainwaves. They also stimulate and then calm the throat and heart chakras. Violet "flowers" bring light and love into the environment. Chevron Amethyst; Is one of the best third eye* stimulators. it enhances inner, intuitive vision and, outer physical vision, and out - of- body journeys. It has powerfully focused energy that dissipates and repels negativity. This stone cleanses the aura and aids in auric diagnosis. It has a strong healing field, bringing harmony to the organs of the body and stimulating the immune system. it helps you to find and implement a positive answer to any problem. Pineapple Amethyst; Has small nodules covering the sides above which emerge the termination points. Looking like the turrets of a castle in a fairytale, it facilitates contact with the mythic and fairytale realms and stimulates the imagination. It is a powerful archetypal healer for family and collective myths. Attributes; Amazonite has a powerful filtering action. At a physical level, it blocks geopathic stress*, absorbs microwaves and cell phone emanation, and protects against electromagnetic pollution. It should be placed between you and the source of any pollution or taped to a cellphone. At a mental level, it filters the information passing through the brain and combines it with intuition. This is an extremely soothing stone. It calms the brain and the nervous system and aligns the physical body with the etheric*, maintaining optimum health. It balances the masculine and feminine energies and many aspects of the personality. It is a stone that helps you to see both sides of a problem or different points of view. At an emotional level, Amazonite soothes emotional trauma, alleviating worry and fear. It dispels negative energy and aggravation. Spiritually, an elixir of Amazonite is extremely beneficial to all levels of consciousness. The stone itself assists in manifesting universal love. Position; Hold or place over the affected point, or wear to protect against microwaves. Place near computers or tape to your cellphone.